I can say that Hawaii has really a lot of natural wonders that tourists should see when visiting the island. During our visit there last week, we circled Oahu. We started our drive from Waikiki area. We stopped by different sites and look outs. 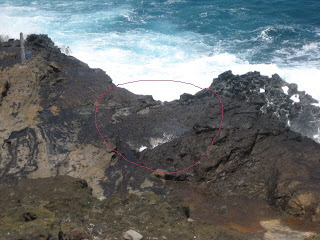 One of our stops was the Halona blow hole. I learned that this is a natural occurrence wherein a molten lava tubes was formed from volcanic eruptions many, many years ago. 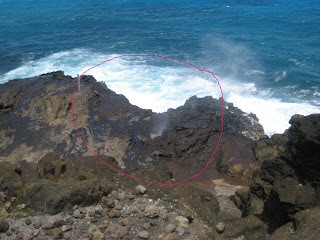 This tube run to the ocean and when the surf is right, this blowhole will shoot water out up to 30 feet in the air (source: oahu.aloha-hawaii.com). I've seen it many times during my first visit there in Hawaii. Last week, I saw it shoots up water in thin air but I wasn't fast enough to take a picture of it. How cool! Thanks for the cyber tour!